Every year around Valentines Day the setting sun lines up such that it strikes the rock wall next to El Capitan and lights up a waterfall, known as Horsetail Falls, to give the illusion of spewing fire. We call this the Fire Falls, although many will remember the original Fire Falls when a now long-gone hotel upon Glacier Point would throw their burning coal off the one of the cliffs. With the explosion of Social Media just about every photographer in the world knows about this and flocks to Yosemite to witness and photograph the event: myself included. The winter of 2012-2013 was very dry and as a result Horsetail Falls, which is fed from snow-melt, didnt exist. My hopes of photographing it again were dashed and instead Willie, Alan, and I spent the weekend running around from place to play trying to find something decent to photograph. 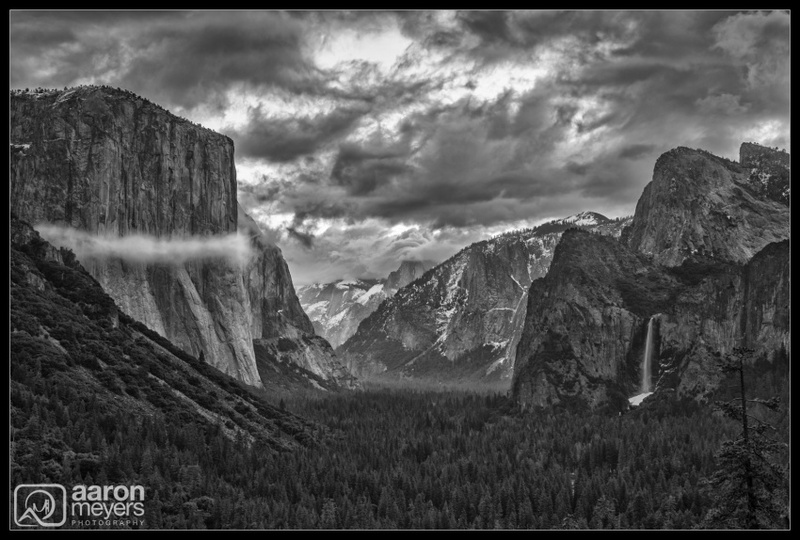 One morning we woke up to cloudy skies and decided to try our luck at the popular Tunnel View. Many other photographers were there but we all were treated to a beautiful ring of fog that decided to hug El Capitan. Between the ring of fog and the cloudy skies this made for a very moody scene. I named this photo Captains Embrace because I loved the way the fog embraced El Capitan.